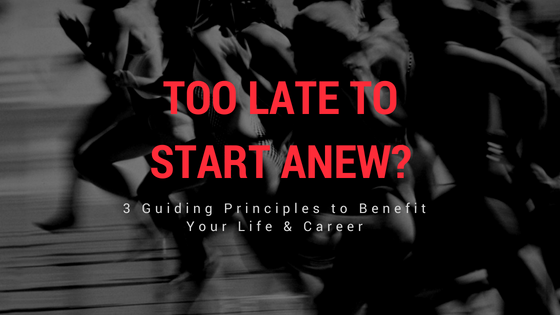 Is it ever too late to start over? This question arises every so often in my mind. Why would anyone give up a comfortable living that included a fancy corporate job title, company car and perks? Why did I choose to move to a new country, start a new family and a new business? In no less than six months. This is my story. I admit it took me a while to pluck up my courage and share it – my journey of starting over as a female entrepreneur at 42. A year and a half ago, at the ‘peak’ of my career success, a wave of change breezed through my life. It made me question where I was and what I stood for. Maybe it was my mid-life crisis, or, as I would like to call it, a wind of change; urging me to stop, reflect and start anew. I remember I had the urge for changing my life from the inside out. I was tired of playing safe and fitting in. I was a female corporate executive, and a single mother living abroad with my daughter. By all professional standards, I had it all. But, in reality, I was living in a ‘safe’ box. I was afraid of commitment, of intimacy in my relationship, and tried too hard to fit in at my workplace. I felt stuck and not being honest with myself. All the pressure and constraints accumulated over time, and the stress took its toll on me. I had an increased discomfort in my body, headaches, and an overall sense of dissatisfaction. Everything culminated one evening when a bike ran over me leaving me with a dislocated shoulder and a bruised body. I remember walking back home that night, shaken to my core by what had just happened. Once I got home, I sat down and kept thinking. The physical wounds, as painful as they were, had an unintended and positive effect. They were the trigger to making me want to be more present in my life. That’s when I decided that living in the ‘here and now’ was my only option going forward. I needed to take the bull by the horns and live my life to the fullest. No more excuses. And that’s what I did! I committed in my relationship and moved in together with my partner, which meant moving abroad. Similarly, on the work front, I realized that my 12-year career as a high potential female leader in technology was over in that organization. I was no longer matching the same values, hence it was time to move on. Within six months I quit my job, moved to a new country, and became self employed. It was exciting and scary at the same time. But, for the first time ever, I had the total freedom to be the creator in my life. While I was adjusting to my new life, I realized that changing the country and my surroundings was not enough to create the change within myself. My inner fears and limiting beliefs were still reflecting into my outside world. I wanted to transform myself, but I was not willing to give up on certain habits like being used to having a regular paycheck. I was somehow looking for the same in my new world. I realized that change had to start within by paying attention to my core beliefs, thinking patterns and habits. So I started to build myself from the inside out. I went through each corner of my soul to understand what holds me back and motivates me. During my inner journey, I began searching for knowledge and understanding, and looked to learn from the best. I got coaching at Tony Robbins organization. I went to India, became a yoga teacher, and studied yoga philosophy with some of the best Masters in the Himalayas. I was trained by the creator of Neuro Linguistic Programming, Richard Bandler, to understand the human mind, and became an NLP practitioner. I deepened my mindfulness practice through the teachings of Jon Kabat-Zinn at the University of Massachusetts. Throughout my traveling and talking to people around the world, I learned that my strength comes from my uniqueness – the combination of my values, of who I am and my experiences. I stopped comparing myself to others, looking for outside validation and took a deep look at myself and what makes me who I am. I understood that I would never live in other person’s skin hence comparison is useless. I focused instead on what makes me unique looking at my experience, passion and skill set. I understood that the way I serve people must be aligned with my unique values and skills set. So, is it ever too late to start anew? I believe it’s not. Our life is full of endings and beginnings starting with our own breath – each new breath is a new beginning. We all are born with true wisdom and intelligence. The way we are raised and guided in our family and society makes us feel constrained, compared, and we wind up developing fears and limiting beliefs. The key is to clear your limiting beliefs, rid yourself from negative patterns, create empowering habits and get in touch with your inner genius. We live in a society where comparison and validation is enforced from a young age. That’s the social stigma! When you doubt whether you’re good enough and live by other people’s standards, it’s time to re-evaluate your priorities and goals in life. You should take time to look within yourself, understand your strengths and weaknesses, identify your passions and your sweet spot i.e. what makes money, what you’re skilled at, and what you’re good at. Based on that, you can put together a plan for your vision. At the end of the day, what matters is to be open to change, enjoy the moment and do the best at all times. That’s what I call a fulfilling and exciting life! If you want to get some ideas, share your transformational goals and look to build the ‘new’ you – my FIT360 Leadership Program maybe an answer for you. Explore your options and build the career and life you want with a session on ME! Mihaela Popescu is the founder of CreateGrowth360.com. She is a global citizen who likes exploring new cultures and has lived in 4 countries across 2 continents. She is passionate about the development of human capital, women in leadership technology, mindfulness and yoga. Mihaela is a firm believer that leadership starts within. As a woman entrepreneur Mihaela focuses on leadership coaching and advisory roles. She dedicates her time on advising IT boards, coaching start-ups and corporate high potentials, mentoring young female professionals and participating to Women in Tech conferences. In her free time she enjoys hiking, mindfulness, yoga, organizing retreats and spending time with family.